Wednesday, 11 May 2011, Day 169/365. 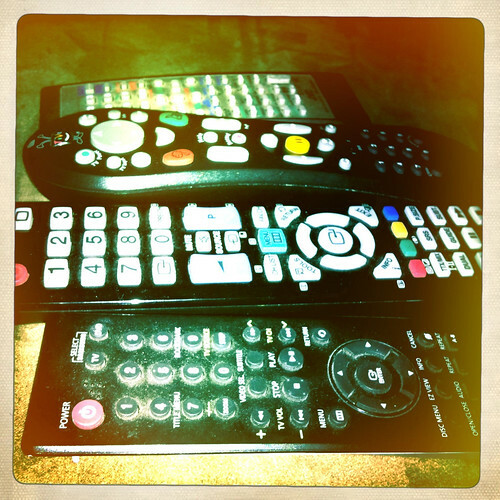 Sometimes when sitting and watching television or a DVD I get confused as to which remote is which. The above four remotes are for the television, Tivo, DVD player and stereo. There never seems to be a universal remote system and I know I’ve left instructions for house sitters on how to operate the things. And as my eyesight deteriorates with age I need better light to see which buttons are which on the various remotes. I’ve learned where the common buttons are but if I need to use a button that I don’t use v ery often I have to go closer to the light or put my glasses on to see what’s what.